The question of women’s ordination in the church in the early 20th century was linked to the question of women’s suffrage in several countries. The St. Joan’s Alliance campaigned in both England and the USA in 1911 for both women’s ordination and women’s suffrage. As the 20th century progressed, numerous Protestant denominations began to ordain women. By mid-century, most of the mainline denominations in the USA had some ordained women. A big breakthrough occurred when the Episcopal Church USA, a member of the Anglican communion of churches, ordained women as priests officially in 1976. This breakthrough followed a long struggle, with 11 women being ordained illicitly (but validly) in 1974, followed by another group of 5 in 1975. This phenomenon inspired hundreds of Roman Catholic women who felt called to ordination to gather together with men and women theologians in Detroit, Michigan to organize an effort to bring their campaign to the Vatican. The gathering took place in late 1975, and was known as The Women’s Ordination Conference. Shortly thereafter, in 1976, an organization was formed to carry this campaign forward, and it was named The Women’s Ordination Conference. There were almost immediate reactions in Rome to these developments. The Pontifical Biblical Commission studied the issue in 1976, and announced that there was no biblical impediment to the priestly ordination of women. However, Pope Paul VI hastily issued an encyclical known as Inter Insignores which denied that women could adequately represent the male Jesus as presider at the Eucharistic table. Women’s Ordination Conference was not deterred, but built a large constituency within the USA, and inspired women in many other countries to organize in similar ways in their countries. Soon after, there was the Canadian Network for Women’s Ordination and by 1985, Maria von Magdala developed a group in Germany. By the mid-1990’s there were also organized groups in Britain, Australia, New Zealand and many other countries. In 1996, at the First European Women’s Synod, held in Gmunden, Austria, representatives from the above-mentioned organizations and other interested women met to organize an international coalition which was to serve as an umbrella group for all of the individual groups. This group became known as Women’s Ordination Worldwide (WOW), and serves as an international resource to all. Two international WOW conferences have taken place in 2001 and 2005, with another planned for 2015. Strategies for finding ordaining male bishops were shared among WOW groups. The result was that what had not produced results on one continent (North America), did so on another (Europe). Catholic bishops were found who were willing to ordain women, and the movement known as Roman Catholic Womenpriests was born on the Danube River with the ordination to priesthood of seven women in 2002. Gisela Forster and Christine Mayr-Lumetxberger. The movement within the Roman Catholic Church known as Roman Catholic Womenpriests (RCWP) began with the ordination to the priesthood of seven women on the Danube River in 2002. The ordination of priests requires bishops. 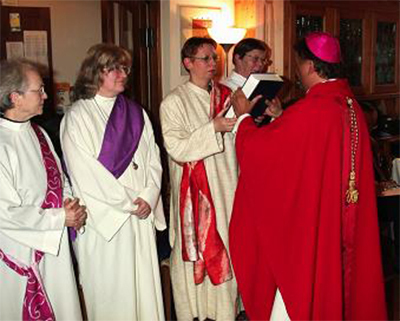 In 2003, canonical male bishops recognized the need for womenbishops to ordain womenpriests. They ordained two womenpriests as bishops: Christine Mayr-Lumetzberger and Dr. Gisela Forster. As the movement spread, the need for English speaking bishops emerged. In 2005, Dr. Patricia Fresen from South Africa and Germany was ordained bishop. In 2006, Dr. Ida Raming, also from Germany, was ordained bishop. As more women presented themselves for ordination in the U.S., Sibyl Dana Reynolds traveled to Germany from the RCWP Western Region in 2008 and became the first Roman Catholic womanbishop in the U.S. In 2009, four women were ordained bishops to serve other US regions. When Bishop Reynolds retired in 2010, Olivia Doko became bishop for the RCWP Western Region until her retirement. Since then there have been additional women ordained bishops to serve the needs in the US, Canada and South America. All of these womenbishopshave been ordained in full Apostolic Succession and carry on the work of ordaining women in the Roman Catholic Church. In June 2004 two native born U.S. citizens travelled to Germany to be ordained womendeacons. 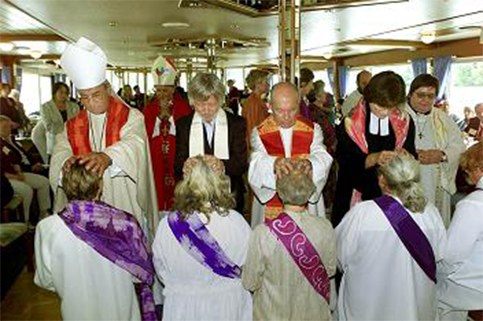 The first RCWP ordinations of womendeacons and womenpriests in North America were held on the St. Lawrence Seaway in Canada in June 2005. 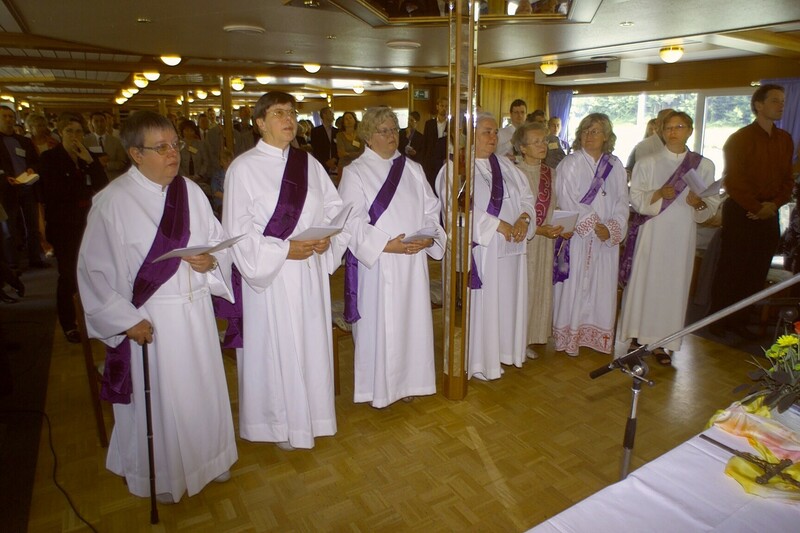 Women from the US were then ordained womenpriests and deacons on the Bodensee in June 2006. The first RCWP ordinations to take place in the United States were celebrated in July2006 on the convergence of rivers in Pittsburgh, PA, where eight women were ordained priests and four women were ordained deacons. The first ordination of womenpriests and deacons in the Western Region occurred in California in 2007, hosted by La Casa de Maria, an interfaith retreat center and ministry of the Immaculate Heart Community of Los Angeles. The number of womenpriests continues to grow. Since 2007, women have been ordained in the USA, Europe, Canada, South America, and South Africa; and, in 2017, the first Chinese woman was ordained. Womenpriests are ministering in over 32 states across the USA. The western region of RCWP includes Alaska, Arizona, California, Hawaii, Idaho, Nevada, New Mexico, Oregon, Washington, Utah and Texas. As we grow from the seven bold women first ordained on the Danube River in 2002 to Women Priests ministering throughout the world, Catholics have accepted us as their priests. Roman Catholic Womenpriests are at the forefront of a model of service that offers Catholics a renewed priestly ministry in vibrant grassroots communities, where all are equal and all are welcome. The voice of the Catholic people—the sensus fidelium—has spoken. Women are no longer asking for permission to be priests. Instead, they have taken back their rightful God-given place ministering to Catholics as inclusive and welcoming priests. Yes, the women of Roman Catholic Womenpriests have challenged and broken the Church’s Canon Law 1024, an unjust law that discriminates against women. Despite what some bishops may lead the faithful to believe, their ordinations are valid because these women have been ordained in apostolic succession within the Roman Catholic Church. The Catholic people have accepted women as their priests and they continue to support RCWP as the movement grows from the seven bold women first ordained on the Danube River in 2002.